Emails between colleagues have also been banned, in a new move that sees employees at all levels leaving their desks or workstations and talking to fellow team members in person. Pebley has consistently won awards for its high levels of customer service and teamwork over the past 12 months, including the title of Garage of the Year, as voted for by its customers, and an Excellence in Aftersales award from industry insiders at the AM Awards. The firm is also the current holder of the Wiltshire Business of the Year title, and also picked up the accolade of Wiltshire Apprenticeship Business of the Year in the same competition. But in the typically macho worlds of motor sales and repairs, friendly banter can quickly get out of control. 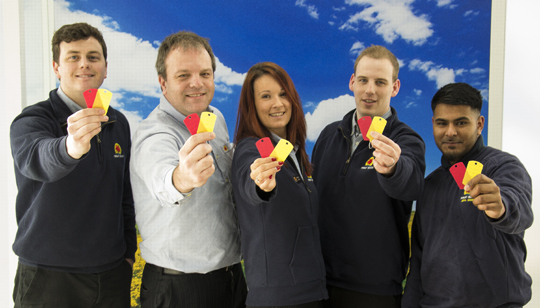 To add a touch of levity to the initiative, Dom has issued every member of staff with a set of soccer-style red and yellow cards. Anyone on the end of an inappropriate comment – or anyone within earshot of the exchange – can issue a red or yellow card. “Interestingly, people on the receiving end tend to issue yellow cards, whereas colleagues who overhear a negative comment are more likely to pull out a red,” said Dom. There are no sanctions for being issued with a red or yellow card. “We just want to encourage best practice,” said Dom. And the initiative has been applauded by Wiltshire-based business psychologist Jan de Jonge, of People Business Psychology Ltd, who said: “Companies that genuinely make a big effort, together with the teams involved, to increase communication, bolster self-awareness and realise what impact we have by the way we behave, ultimately will reap the rewards. This entry was posted in Business and tagged Pebley Beach. Bookmark the permalink.